Since mid-2017, more than 723,000 Rohingya refugees have fled from Myanmar to neighboring Bangladesh. The majority of refugees are women and children, with a significant percentage of refugees under age 12; many have sought shelter in Bangladesh’s Cox’s Bazar district, where services (such as water and energy) are stretched beyond their limits. The massive humanitarian response has been addressing immediate needs, such as access to clean water, shelter, and health services. 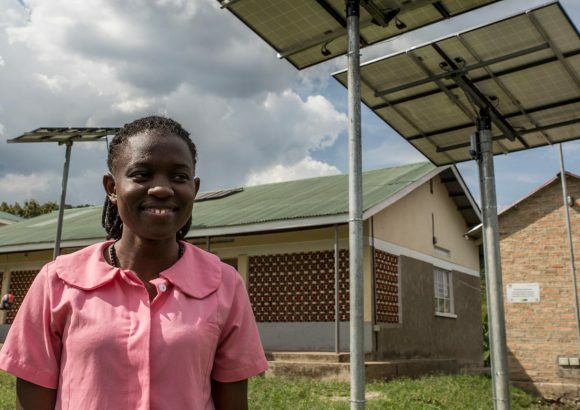 To learn more, we spoke with Dr. Iftikher Mahmood from the Hope Foundation, who in partnership with SolarKiosk and others have deployed a reliable energy solution to power up essential health services. Below, please find our written interview with Dr. Mahmood, which has been edited for context and clarity. Luc Severi: Can you provide a brief overview of the situation in Cox’s Bazar and the vulnerabilities and health needs of these communities? Dr. Iftikher Mahmood: The situation of the Rohingya refugees living in Cox’s Bazar can be described as a major humanitarian crisis. Many traveled on foot for many days before reaching the camps and most arrived in Cox’s Bazar very sick from mental and physical stress, starvation, and severe injury. Many of the women arrived pregnant or having lost children due to death or violence from the conflict. The patients we see, at HOPE health facilities, have been deeply traumatized by the violence and the stress of their journey to reach safety. Today, this vulnerable population is still struggling to survive, living in poor conditions where too many are suffering and dying from minor, preventable diseases in the overpopulated camps. LS: A recent estimate suggests that only about 10% of refugees living in camps have access to modern, basic lighting. How does this lack of energy access impact the daily lives of refugees, particularly as they seek medical and emergency services? How does it affect the health services that clinics can provide? IM: When populations arrive in slums or humanitarian settings, they face harsh conditions, exacerbated by a lack of energy access. This lack of energy limits refugee access to basic quality of life, as it limits the time frame and access for productive activities, especially in seasons where daylight is shorter. Lack of energy means poverty and food insecurity. For example, when our midwives at HOPE Foundation assist pregnant women deliver their newborns, the lack of lighting can make it a very distressing situation for both mothers and healthcare providers. It is exceptionally hard to detect a hemorrhage or abnormalities in the labor process if you can’t see the patient. Lighting is critical to successful outcomes for our patients. 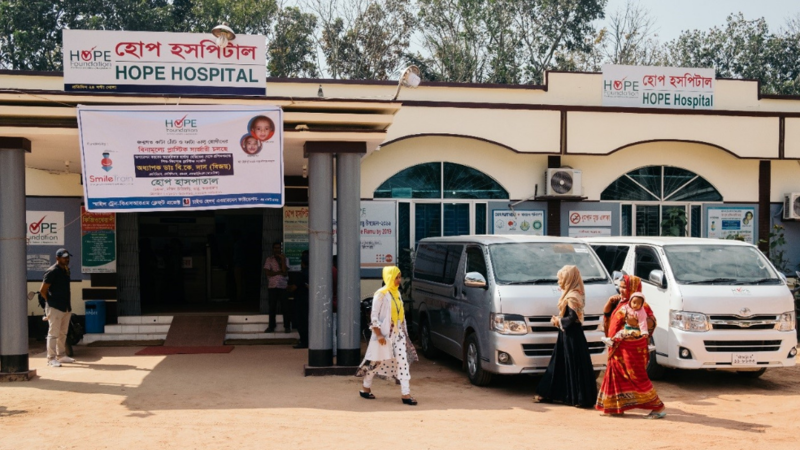 LS: Recently, your organization, the HOPE Foundation for Women and Children of Bangladesh, opened the HOPE Field Hospital for Women in Madhuchara (Camp 4) for Rohingya refugees, which has the distinction of being the only hospital in the camp specializing in the care of women. It’s also powered by solar energy at a scale unseen within the camps. What inspired you to take this bold action, and why is the HOPE Field Hospital uniquely positioned to make a difference? IM: Given the urgency of the situation, I knew that women and children would face the most difficult barriers to getting essential medical care. I also knew that the refugees would stay in Cox’s Bazar because they are too scared to return to their villages in Myanmar. This was one of the reasons why I decided HOPE needed to construct a field hospital, easily accessible by this population. The HOPE Field Hospital for Women is unique for several reasons. First, the hospital is partly powered by solar energy. The Abundant Future Foundation, in partnership with SolarKiosk, collaborated to provide the funds and material resources needed to make our hospital environmentally friendly. 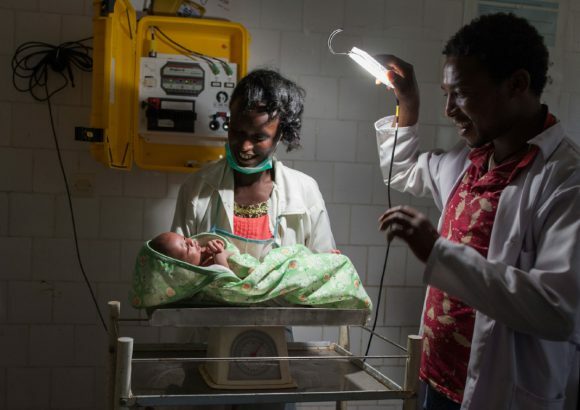 Additionally, thanks to UNFPA’s support, our midwives and doctors now have access to solar lamps, which can last eight hours and easily recharge in direct sunlight. Our hospital is also unique in that we are removing the barriers for women to seek gender-specific services by providing specialized care in a gender-segregated facility for women. We provide sexual and reproductive health services, and we work to address a general lack of knowledge regarding sexual and reproductive health and family planning. LS: The HOPE Field Hospital is uniquely impactful because it has been able to leverage the strengths of different partners to deploy solutions to a very hard-to-reach area. Can you explain how you were able to overcome coordination barriers, and turn it into a strength? IM: What helps HOPE Foundation for Women and Children of Bangladesh overcome barriers is our community-based approach. I was born in Cox’s Bazar, Bangladesh, and established HOPE Foundation in 1999. We are a well-known organization with an excellent reputation among the population of Cox’s Bazar because we have been taking care of this community for 20 years now. Most of our staff are local professionals who grew up in the area, and who know the town very well , because it is their home. Being a locally run organization has been critical to our success and has been our top strength in overcoming the coordination barriers any organization would face in getting a project like the HOPE Field Hospital for Women off the ground. We are also fortunate to count on the support of our longtime partners, who have supported us through our challenges. LS: The solar clinics were only deployed about four months ago, but have you or your colleagues already experienced any significant changes in how you’re able to deliver health services? What stories or anecdotal evidence can you share with us? IM: One key indicator of the powerful change we’ve experienced with the solar clinics is the increased number of patients to our facilities. This is particularly important because it’s very hard to earn the trust of the Rohingya community. The increase in patients since the establishment of the solar clinics means that the refugee community feels more confident that we have the capacity and expertise to help them. Every day, we increase the number of expecting mothers getting prenatal andantenatal care — and having safe deliveries with us. An interesting point to make about our solar clinics is that now women can go into labor in an air-conditioned room. This might sound insignificant, but being in labor in a hot room at 85ºF can be very painful. It’s crucial that every woman experience labor and birth in healthy and comfortable conditions. LS: What advice do you have for health organizations that recognize that reliable electricity is necessary to delivering quality health services, but do not have the required energy expertise to deploy a robust solution? What experience or recommendations can you pass along? IM: I would encourage them to keep working hard towards getting the necessary support they need to implement reliable electricity in the places where they are delivering their health services. They should speak up about what they do, what they need, and how having access to reliable electricity will impact the services they provide. Finding a believable message to share is crucial for finding partners who trust your vision. While this is a long process, it’s very much worth it. Be patient and persistent.